Geoff Funkhouser (left), JW Myers (middle) and Sara Smith (right) at a recent acting class. Smith And Funkhouser are reading from a script while Myers gives them some tips. JW Myers, an acting coach, producer and director, held two acting workshops Saturday for Creative Court House. One class was for children and the other class for adults. He is known for films, “The Pledge (2011),” “Flamingo Dreams” (2000) and “A Christmas Tree Miracle” (2013). Myers was enthused about the children’s workshop. According to him, the kids jumped right in and had a great time. Mandy Miller, the president of Creative Court House, said her daughter took part and had a blast. The adult workshop began with the participants getting to know each other — just a little chatting. Myers then explained why he focuses so greatly on improvisation and his feelings toward creativity. The workshop went from chatting to simple games to loosen up participants. Simple word play that involved the imagination and had everyone laughing. From there, another game was brought in that involved improvising scenes but still kept everyone at ease and having fun. The workshop transitioned into a more serious note while reading scripts with a partner. Myers offered advice and assisted in making the scene be more realistic. While doing some of the improvisation scenes, Myers showed the participants exactly what he meant. He focused into the very small movements and habits of a character he was portraying. The results made participants raise their eyebrows in awe. This time around, there were three people who joined for the adult workshop. Myers hopes to have one in Washington Court House again and to see more people join into the fun. He isn’t sure when the next one will be as he lives in Maryland, but he does come to Ohio to teach in larger cities. 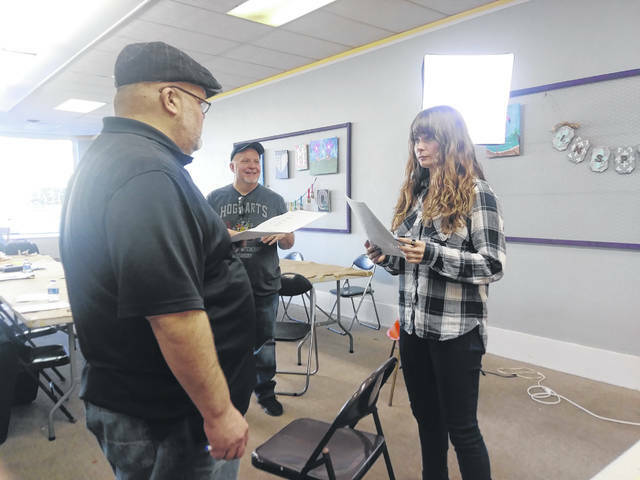 https://www.recordherald.com/wp-content/uploads/sites/27/2019/03/web1_JW-Myers-ac-jpeg.jpgGeoff Funkhouser (left), JW Myers (middle) and Sara Smith (right) at a recent acting class. Smith And Funkhouser are reading from a script while Myers gives them some tips.